The health effects of caffeine are debated in medical circles. What is not debatable is that many people suffer from caffeine addiction, and caffeine withdrawal is a significant problem for those trying to kick the habit! Caffeine is a bitter white substance which is a central nervous system stimulant, and mild diuretic in the body. Found in over 60 plants, it is consumed in coffee, tea, soda, and chocolate. It is a mild psychoactive substance, promoting alertness, increasing mental focus, stimulating metabolism, mobilizing fatty acids for energy, and counteracting physical fatigue. Caffeine addiction is a matter of perspective, but the fact is that millions of Americans begin their day with it, and can’t seem to function without their daily coffee or soft drinks. The fact remains that caffeine is a drug, and that caffeine withdrawal is a real problem. I used to use caffeine and finally found that as much as it helped with alertness and focus, the health effects of caffeine were not worth it! What makes caffeine addiction so difficult to avoid for many people is that there are no legal sanctions or social stigma against it. However it does have serious consequences for your long-term health. Caffeine is a diuretic, causing you to produce more urine. and it causes calcium excretion from the body at a faster rate. For those suffering from osteoporosis, this is bad news. It can cause rapid heartbeat or trigger arrhythmias through its effect on both the central nervous system and other tissues. Anyone with heart problems, should avoid it all together. Caffeine addiction like any other substance related dependence is a unhealthy. It allows you to temporarily get away with less sleep, but always has long term consequences that are not good. Most of you know that green tea protects against heart disease, cancer and other health problems. Polyphenols are what give green tea this protective quality, and now it has been found that coffee as well contains beneficial polyphenols. Confused? A little common sense is in order. There are degrees of sensitivity to caffeine. If you feel bad when drinking coffee or tea, including green tea, then you have to get polyphenols in a supplement form to avoid the bad health effects of caffeine. The other method is a cold water extraction using carbon dioxide which retains 95% of the beneficial polyphenols. Green tea, which has been decaffeinated using CO2, is obviously the better choice. 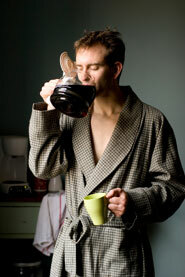 There are other beneficial aspects of caffeine such as alertness and focus. For instance, who could argue with drinking coffee when you are driving to help stay awake behind the wheel. Sports performance can also benefit from caffeine use, depending on the sport, and mental focus in an academic setting is a positive aspect of careful use vs. caffeine addiction. You must weigh these facts and decide whether the health affects of caffeine are balanced off by the beneficial flavonoids and other compounds in coffee, tea, or chocolate. What is life like without caffeine? Well my joints hurt less at age 53 than at 33, because caffeine is no longer dehydrating my body. I no longer get rapid heartbeat, sweating, and other problems associated with caffeine addiction. For me caffeine withdrawal was not a problem, because the choice was very clear. If I continued using caffeine I would have more problems, and seriously affect my health in the long term. I was tempted to use it, but the health effects of caffeine and my increased sensitivity to it meant that I couldn’t tolerate even small amounts. I have to avoid it altogether. To avoid these problems, reduce your intake of caffeine gradually, beginning with what you normally consume at night, and then reducing your consumption during the day in gradual steps. Eating properly to keep your blood sugar stable will help avoid energy crashes that make you want to reach for that soda or cup of coffee. Proper exercise, helps you maintain stable blood sugar levels, and avoid the energy fluctuations that cause you to reach for the caffeine to perk yourself up, thus avoiding the negative health effects of caffeine, without caffeine withdrawal. Ginseng Tea: Naturally beneficial alternatives such as the Adaptogenic herb Ginseng provide a lift without the negative health effects of caffeine. Ginseng should be taken on an empty stomach upon arising in the morning. Yerba Mate: is a non-caffeinated tea from South America which has a sweet spicy flavor and is loaded with beneficial nutrients and anti-oxidants. Rooibos Tea: This is a South African red tea with a somewhat nutty flavor. It is an excellent thirst quencher and provides important nutrients and anti-oxidants, which promote health and help, ward off illness. With what we know about the health effects of caffeine, you should work on eliminating caffeine use.Your health will benefit greatly and in time you will wonder why you ever needed it.